To open, I humbly make a land acknowledgment I would like to recognize and acknowledge the indigenous people of this land: the Lenni Lenape, Shawnee, and Hodinöhšönih (hoe-den-ah-show-nee)—the six Nations, that is, the Mohawk, Oneida, Onondaga, Seneca, Cayuga and Tuscarora (tus-ka-roar-ah). We are gathered today on Jö:deogë’ (joan-day-o-gan’t), an Onödowa’ga (ono-do-wah-gah) or Senaca word for Pittsburgh or “between two rivers”: the welhik hane (well-ick hah-neh) and Mënaonkihëla (men-aw-n-gee-ah-luh). These are the Lenape words for the Allegheny and Monongahela rivers, which translate to the “best flowing river of the hills” and “where the banks cave in and erode.” While a land acknowledgment is not enough, it is an important social justice and decolonial practice that promotes indigenous visibility and a reminder that we are on settled indigenous land. Let this land acknowledgment be an opening for all of us to contemplate a way to join in decolonial and indigenous movements for sovereignty and self-determination. I recently added a similar land acknowledgment statement to my course materials, thanking the Tutelo/Monacan people upon whose land Virginia Tech stands. Inspired by a graphic from Northwestern University, I also created the draft image (shown on the right), which I intend to add as a poster on my office door after I receive feedback on whether it is appropriate. I admit it has taken me too long to add these statements to my course materials. Angela Haas, from Illinois State University, shared the first land acknowledgment statement I ever heard at a Computers and Writing Conference session several years ago. I was impressed by the statement and wished I could add one to my own work. At the time however, I wasn’t sure how to construct a land acknowledgment statement, so I didn’t try. I was and am ashamed of my behavior. I let my privilege as a non-indigenous person serve as an excuse, telling myself it was better to say nothing than to piece together an acknowledgment I wasn’t sure was appropriate. I want to share some resources readers can use to add a land acknowledgment statement to their publications, events, and course materials. Check your campus for an existing land acknowledgment statement. Check with American Indian and Indigenous Studies student groups, cultural centers, and departments. If such resources do not exist, contact your office of diversity and inclusion. A research librarian at your school can also help. If you are working in Canada, such a statement is likely to already exist, so check with your colleagues. Take advantage of existing resources if you plan to write your own land acknowledgment statement. 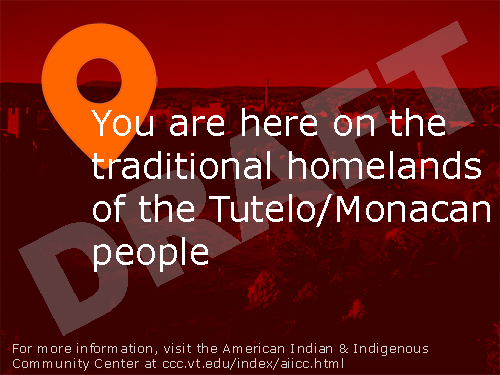 If a statement does not exist, use the Guide to Indigenous Land and Territorial Acknowledgments for Cultural Institutions from New York University and the #HonorNativeLand Guide from U.S. Department of Arts and Culture to get started. 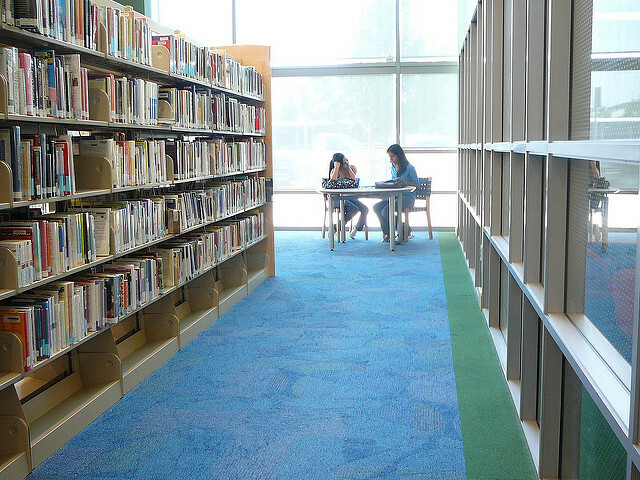 Again, a librarian at your school can also help you find relevant resources. Review land acknowledgment statements from other institutions. Check peer institutions your school uses for benchmarking purposes. Also look for examples from schools and cultural centers from your geographical area, which likely share the same tribal lands you do. These Example Land Acknowledgment Statements demonstrate the range of details and styles used in the genre. 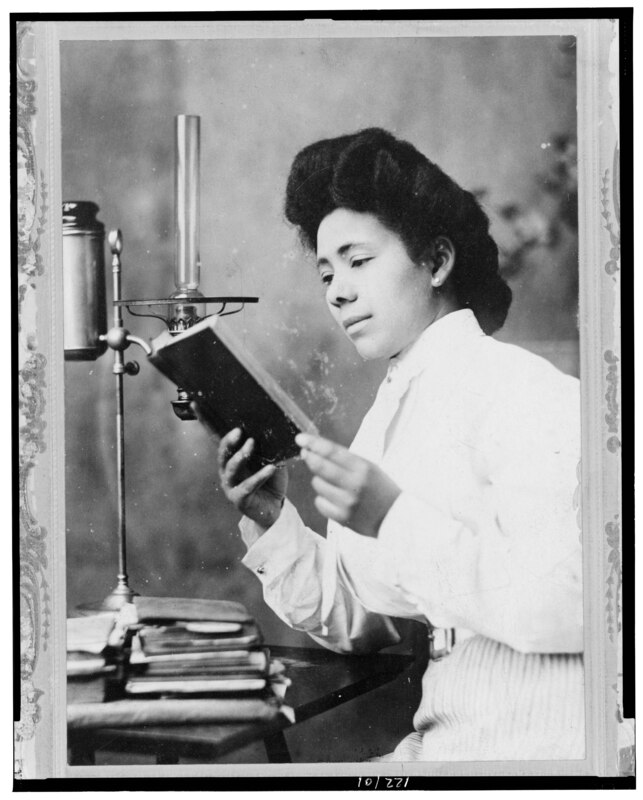 Learn how to pronounce the names of the indigenous peoples included in your statement. As Kyllikki Rytov pointed out on the WPA-L listserv, “[I]n terms of erasure, getting names right is paramount.” Land acknowledgments must include pronouncing names with respect. The #4C19 statement above includes parenthetical pronunciation information, which can serve as a model for your own statement. If you are unsure how to pronounce a name, check with local tribal members or with campus American Indian and Indigenous Studies cultural centers, student groups, or departments. Your library’s research staff can also help you find pronunciation information. Ask local tribal members or other experts to review your work. As I suggest in relationship to my image above, you need to check any land acknowledgment statements you create to ensure your words and images are appropriately representative of and respectful of the tribe(s) whose land you are acknowledging. If you have an American Indian and Indigenous Studies cultural center or department, ask them if they can give you feedback. Once you have a land acknowledgment statement, use it and encourage others to use it as well. Open your events with your land acknowledgment statement. Add a land acknowledgment statement to your research and other publications. Include a land acknowledgment statement on your course materials. Remember that a land acknowledgment statement is only the first step. It doesn’t immunize you against social injustice or colonial practices. Examine your reading lists to ensure they include indigenous authors. Include indigenous issues in your discussions. Invite students to explore indigenous readings and events in their work. Encourage them to add land acknowledgment statements to their own projects. Call out actions that demean native peoples. Make the arts, cultures, and concerns of native Indian and indigenous visible in your courses, research, and events. I hope these resources will help you add a land acknowledgment statement to your work. The documents from the second bullet point include details on why land acknowledgments are important. You can use these resources to help students understand why you use the statements and help them learn strategies to make their work diverse and inclusive. If you have a land acknowledgment statement you would like added to the Example Land Acknowledgment Statements document, please share it in a comment below. If you have other suggestions for acknowledging indigenous people, please let me know. This post originally published on the Bedford Bits blog. Last week, I shared a series of active learning strategies focused on design principles, related to a research poster project that students are working on this month. That activity inspired me to consider how I could rethink active learning strategies to discuss design and visual rhetoric. The result is my new versions of three activities, suited for analysis of a visual document design or a visual artifact (such as a poster). For each task, I explain how the original learning task is used, and then I follow with the prompt that I created for my twist on the strategy. Original: Muddiest-point and clearest-point tasks ask students to reflect on recent information from the class and identify the relevant ideas or concepts. The muddiest point is the idea or concept that the student understands least while the clearest point is the idea or concept that the student understands most fully. The Twist: Examine the image or document and identify the muddiest point and the clearest point in the visual design. For the muddiest point, identify the place in the visual where the image, the text, or other aspects are hardest to identify and understand. It might be a place where the image is blurred, faded, overexposed, or in shadows. It could be a place where an element is small, cropped off or otherwise incomplete. Once you identify the muddiest point, consider what it contributes to the overall image or document and why it is minimized in comparison to other aspects of the image or document. For the clearest point, look for the opposite place, where the image, the text, or other aspect is clearest and easiest to identify and understand. It might be a place that it larger, sharply focused, brighter, or highlighted in some way. Once you identify the clearest point, consider what it contributes to the overall image or document and why it stands out so clearly in comparison to the other aspects of the image or document. Original: This active learning strategy relies on the physical layout of the classroom. The teacher sets up a station—with a discussion topic, problem to solve, or issue to debate—in each of the room’s four corners. Students are divided into four groups and rotate through the stations, or they visit only one station and then share the corner’s discussion with the full class. The Twist: Focus on the four corners of the image or document you are examining. Label them as Top-Left, Top-Right, Bottom-Right, and Bottom-Left. Think about what appears in each corner—text, color, drawings, photographs, shadows, and so forth. In addition to considering what appears in each corner, reflect on aspects such as the size of the elements. Take into account how the content of the four corners relates to the rest of the image or document and how the corners relate to one another. After your analysis of the four corners, hypothesize what the corners contribute to the overall visual design. Original: Background knowledge tasks can take various forms, from freewriting about a previous lesson or experience to a scavenger hunt. The teacher either asks a question that will trigger students to recall prior knowledge about the topic, or the teacher can set up situations that require prior knowledge to complete a task. This strategy tells the teacher what students already know, so she can avoid reviewing information unnecessarily. Further, it helps students recall concepts and ideas that a new lesson will draw upon. The Twist: Take the idea of a background knowledge probe literally. Examine the image or document, and focus on the background of the design. How does the background differ from the rest of the image or document? Does it complement the foreground? Does it provide a contrast? Is it a simple, blank canvas, or does it add information to the message? Based on your examination of the image or document, explain how the background contributes to the overall visual. Like the active learning strategies that I shared last week, the three active learning strategies above ask students to look at the design of an image or document from different perspectives. By focusing on a specific area of the visual message, students isolate how the various parts of the visual contribute to its overall message. Do you use active learning strategies in the classroom? How do you ask students to examine the way that visual design contributes to a message? If you have classroom activities to share, I would love to hear from you. Please leave a comment below to tell me about your strategies. Image credit: See Writing Differently 2018 7 by COD Newsroom on Flickr, used under a CC BY 2.0 license. My students are beginning research posters this week, so the course is returning to information on effective design and in particular the design principles of Contrast, Repetition, Alignment, and Proximity. In today’s post, I’ll share the active learning tasks I’m using to ask students to recall prior knowledge and give them hands-on work with the design principles. Active learning tasks ask students to engage directly in their learning process by “involving [them] in doing things and thinking about the things they are doing” (Bonwell & Eison 1991). A simplified explanation of this teaching strategy compares students’ minds to sponges and to mechanical gears. Passive learning strategies, such as lectures, treat the student’s mind like a sponge, ready to absorb ideas as it creates a repository of information. It aligns well with Paulo Freire’s banking model of education. Active learning strategies, alternately, engage the student’s brain as if it were a machine made of interlocking gears, turning and churning as it tests hypotheses and creates knowledge. The series of tasks I describe below asks students to recall what they know about the design principles, to apply the principles through several analysis activities, and to forecast how they will use the principles in their research posters. The course includes weekly writing and revision activities that students complete individually and in groups. Discussion prompts and related activities are posted as weekly activities. Since I teach a fully-online course, this work is submitted as a discussion post to me in the course management software. These tasks are much like the in-class activities that would be part of a face-to-face course. The tasks below give you the short version of the prompt. I add more specific details on how to post, share, and reply to one another in the assignments shared with students. Go on a hunt on campus or online for a good or bad visual. It can be any kind of visual—a digital sign, a full-page ad in a magazine, a billboard, and so forth. It doesn’t have to be a research poster. Here’s one way to find a visual for this discussion: Find a bulletin board on campus. Stand across the hall from it, and identify the one piece on the bulletin board that grabs your attention. Take a photo of the visual you find or save the visual if you found it online. Add a paragraph that tells us why it is a good visual or a bad one. Use the ideas from the textbook to support your ideas. Describe how the visual uses the design principles. Diagnose the design shortcomings of the visual. Prescribe solutions that will improve the visual. Choose a visual from a previous project in the course or one that you are planning to use in your research poster. Annotate the visual with details on how you have used the design principles of contrast, repetition, alignment, and proximity. Label features of the visual with arrows that pair with related descriptions and explanations of the design principles. Use Figure 11.1 on pages 251–52 of Technical Communication as the model for your response. Based on what you know about the design principles of contrast, repetition, alignment, and proximity, create a design plan for your research poster. Brainstorm a list of ideas you want to emphasize in your poster. Apply design principles to the ideas, indicating strategies you can use to highlight the content on your poster. What font and font size will you use for regular text? What font and font size will you use for Level 1 headings? Level 2 headings? What colors will you use on the poster, and where will you use them? These four active learning activities seem relatively simple on the surface; however, they build on one another to lead students to recall how the design principles work and then apply those principles to their own work. What strategies do you use to encourage students to apply composing and design strategies to their own work? Please tell me by leaving a comment below. Freire, P., & Macedo, D. (2000). Pedagogy of the Oppressed, 30th Anniversary Edition (30th Anniversary edition; M. B. Ramos, trans.). New York: Continuum. Photo credit: The Open University Brand Design Guidelines by DAMS Library, on Flickr, used under a CC-BY 2.0 license. I ask students to complete a Progress Report before they leave for Spring Break. The assignment requires them to take stock of the work they’ve completed and the work they still need to do. When they return to their projects after break, their progress reports help them know where to resume their work on the project. The progress report assignment is due the Friday before Spring Break starts, so March 8th this year. The three-day grace period for the assignment creates a challenge, however. I don’t count the days of Spring Break, so the grace period ends the first day students are back on campus, March 18 this year. While I intend for students to complete the progress reports before they leave, the grace period ensures that their grades are not harmed if they wait until they return. Over the years, I have tried various ways to entice, encourage, and, let’s face it, beg students to complete their progress reports before they leave. I argue that the strategy will make their work easier and more efficient when they return to classes, but the lure of leaving early for that week off from classes wins out. Typically only five or six students turn the report in ahead of time, and a few more will turn it in during Spring Break. Most students submit it when they return. This week, I tried a different strategy by appealing to their interest in higher grades. In short, I tried a bribe. If they turned in their progress reports by 11:59 PM on Friday the 8th, they can earn up to 125 points. If they turn in their report any later, they can earn no more than 100 points. The course is graded on accumulated points. The extra points matter, but no one is punished for using the grace period. The result is that 26 students turned in their progress reports before leaving town, significantly more than the typical five or six. There is still room for improvement, as those 26 students represent only 31% of the enrollment. I’m making progress though, so bribery seems like it was a good choice. What do you do to convince students to make the best choices? Have you tried bribing them? Do you have other strategies that work? I would love to hear from you. After all, I need to convince that 69% of the classes who didn’t turn in their progress reports. To share your ideas, just leave me a comment below. Last week, I shared an activity encouraging students to move beyond using a Google search to find research. This week’s activity asks students to check the resources they have found for variety. As was the case last week, Alison J. Head and Michael B. Eisenberg’s 2010 article “How Handouts for Research Assignments Guide Today’s College Students” inspired the activity. Head and Eisenberg found that students typically searched only for the kinds of sources required by the assignment. For instance, if the assignment asks students to find two books and an online source, students find only those items. Instead of prescribing sources for students’ work, this week’s activity asks students to look for variety in their sources and provide brief annotations that explain how they will use the sources. In the activity as shown below, I removed some information that is relevant only to the students in my classes. The five kinds of research sources came from the course textbook, Markel and Selber’s Technical Communication (12th edition). You can easily customize the activity for your class by using the list of resources from your course textbook. Any textbook that covers writing research projects will include a similar list. Bibliographic citation, using whatever format is appropriate for your field (e.g., Electrical engineers use IEEE). A one-sentence (or fragment) summary of the information included in the source. Details on how you plan to use the source in your project. How many different kinds of sources you have found? If a type of secondary research source is not appropriate for your project, explain why. How varied are the sources in each category? Consider the author(s), publisher, publication date, and other relevant factors. Review your audience analysis for the project, and state the kinds of research sources your readers will expect in your document. Explain how your sources meet the audience’s expectations. Explain whether the research sources you found show variety, using specific details. If your sources do not demonstrate variety, set additional research goals to find more secondary sources. Specifically state the additional kinds of sources you will look for in a paragraph or list. Review your answer to make sure it uses business-appropriate spelling, grammar, and punctuation. Students are still working on this activity, so I don’t have results to share. I hope students will develop a habit of examining their research for variety. By having them include annotations that indicate how they will use the sources, students should move beyond variety simply for the sake of variety. Their choices have to be useful to their projects. I’m looking forward to reading their responses. I would love to hear your responses to the activity too. Please leave me a comment below telling me your thoughts or sharing strategies that you use when teaching research projects. Photo credit: A place to study. by San José Public Library on Flickr, used under a CC BY-SA 2.0 license. When I create an assignment, I intend the information I include about research requirements to suggest starting points and to encourage exploration. Instead, students probably use that information to determine the bare minimum required, doing only the research described instead of jumping off into deeper exploration. Alison J. Head and Michael B. Eisenberg (2010) examined “How Handouts for Research Assignments Guide Today’s College Students,” finding that students use assignments less as a guide and more as a road map. If the assignment handout calls for three sources, students use only three sources. Directed by the assignment handout to use at least two books and an online site, students meet the requirement and find little or no more. In an earlier study, Head and Eisenberg (2009) reported that “Almost every student in the sample turned to course readings—not Google—first for course-related research assignments. Likewise, Google and Wikipedia were the go-to sites for everyday life research for nearly every respondent” (3). I’m left with a conundrum: I want students to look beyond the course textbooks, Google, and Wikipedia, but I don’t want to prescribe the kinds and number of resources they should consult. My ultimate goal is to teach students how to thoroughly research a topic on their own, choosing the best tools to use and gathering relevant sources for their research projects. I designed the following activity to kick off students’ research. In it, I ask students to evaluate the available research tools and then plan how to use those tools to conduct their research project. The activity below has some minor changes to remove specific information that is relevant only to the students in my classes. I took the six kinds of research tools from a list from the course textbook, Markel and Selber’s Technical Communication (12th edition). You can easily customize the activity for your class by using the list of resources from your own textbook. Any textbook that covers writing research projects will include a similar list. For each of the six research tools, provide the information below. Your answer will map out how you will conduct research for your project. Indicate how each of the six research tools is (or isn’t) appropriate for your research project by responding to the following questions. What specific research tools in the category are available for your topic? For example, name the online databases that are appropriate for your topic. What kind of information are you likely to find using the particular tool? 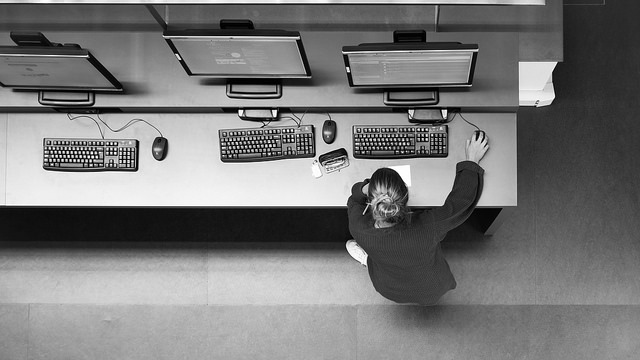 How relevant is the information to your research project? Based on your evaluation, how appropriate is the kind of tool for your research project? For each tool that is appropriate for your research project, explain specifically how you will use the tool. What keywords will you use with each tool? What kind of research sources will you look for with each tool? How will you manage the sources that you find? In other words, indicate how you will save or borrow the sources. The answers to these questions may be similar for the different research tools. Try using a table to organize the information to simplify your response. You do not need to use full sentences for Step 2. I’ll supplement this activity with links to some specific resources from the campus library, such as these Research Guides for Various Subject Areas. I will also suggest that students consult a librarian for help. I think my assignment meets my goal. 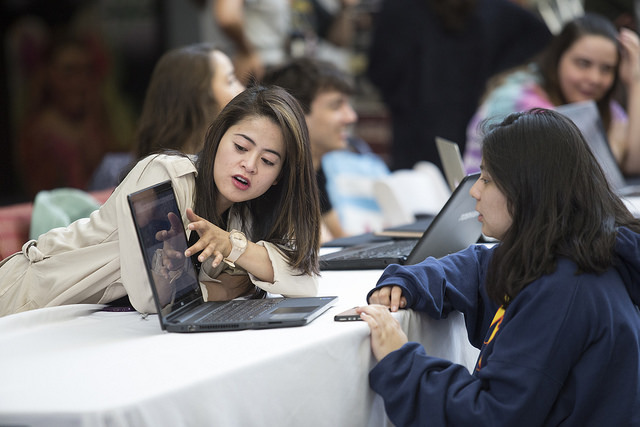 It encourages students to research beyond the familiar sources like their textbook and Google. At the same time, it guides students toward easily accessible resources without telling them exactly what to do. Next week, I will share a follow-up activity that asks students to report on the specific resources they have discovered. Do you have an activity to share that helps students engage in deeper exploration when they conduct a research project? I’d love to hear from you. Tell me about it by leaving a comment below. Photo credit: All She’s Armed With Is Research. by Markus Binzegger on Flickr, used under a CC-BY 2.0 license. Recently I needed a resource to help students understand brainstorming. I knew that they generally understood the idea, but I wanted to encourage them to try some new strategies and stretch their invention skills a little. After a few disappointing Google search results, I found myself at the “Tips & Tools” page of the UNC-Chapel Hill Writing Center site. The handouts range from ideas on Thesis Statements to basic strategies for working on a Dissertation. Some of the resources focus on general writing advice, such as dealing with Procrastination and Writing Anxiety. Others address topics frequently heard in the writing classroom, like how to use Gender-Inclusive Language and ways to work with Writing Groups effectively. Perhaps one of the best things about the site is that the handouts are published under a Creative Commons Attribution-NonCommercial-NoDerivs 4.0 License. That means, as the site explains in the footer, “You may reproduce it for non-commercial use if you use the entire handout and attribute the source: The Writing Center, University of North Carolina at Chapel Hill.” If you need a supplement for your class or a specific student, these “Tips & Tools” have you covered. Have you found an online resource that is particularly helpful in the writing classroom? Please share your recommendations in the comments below. I’d love to see the sites you use with students. I love the “Thinking Visually” resources in Mike Markel’s Practical Strategies for Technical Communication (2nd ed.). The example shown in the screenshot on the right outlines the six major characteristics of a technical document. As you flip through the pages of the textbook, these full-page graphics stand out, catching students’ attention with their strong contrast and reader-friendly presentation of the information explored in more detail in the text. 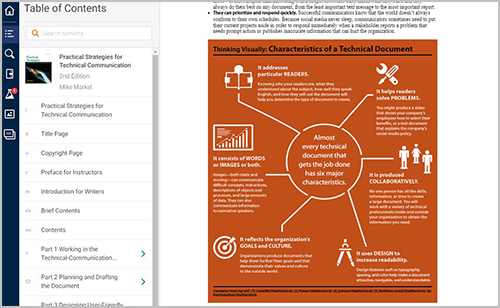 Reflecting the increasingly visual nature of today’s learners and of technical communication itself, the Second Edition includes new “Thinking Visually” graphics, developed with feedback from instructors. This feature provides an accessible, modern take on key principles and concepts throughout the text. The feature this quick summary presents definitely stands out, even in a highly visual textbook like this one. I decided to create my own infographic resources to persuade students to think visually about the concepts in Technical Communication. I’m starting with documentation. Students struggle typically struggle with that topic, and its coverage in most textbooks is dense and text-heavy. I began with this page (shown as an image) on the question, “Why Use Documentation?” It is also available as a Google Doc or a PDF to provide full accessibility to students. 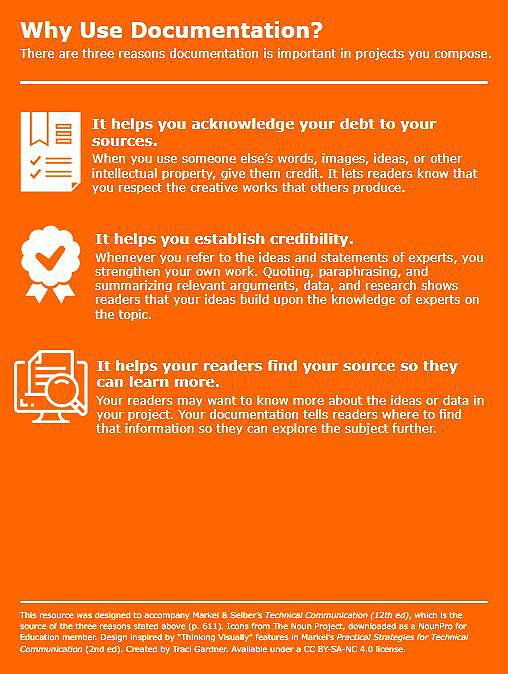 The three reasons that documentation is important listed in the resource come from the Appendix on “Documenting Your Sources.” The infographic is rather simple, but I hope clear and direct—just like those from Practical Strategies for Technical Communication. Tell me what you think. I plan to make several more before students begin their major research projects in a few weeks, so I can definitely use some feedback. Just leave me a comment below. NOTE: Practical Strategies for Technical Communication has just been published (2019) in a third edition, but I only have access to the second edition presently. 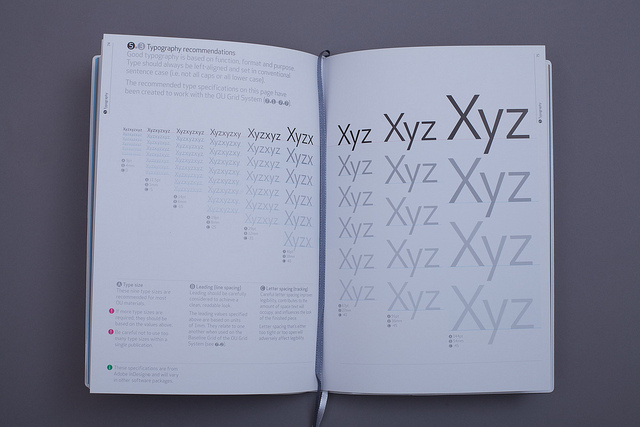 The “Thinking Visually” are included in the third edition as well. For students to do well in the courses I teach, they have to understand how the course software works. 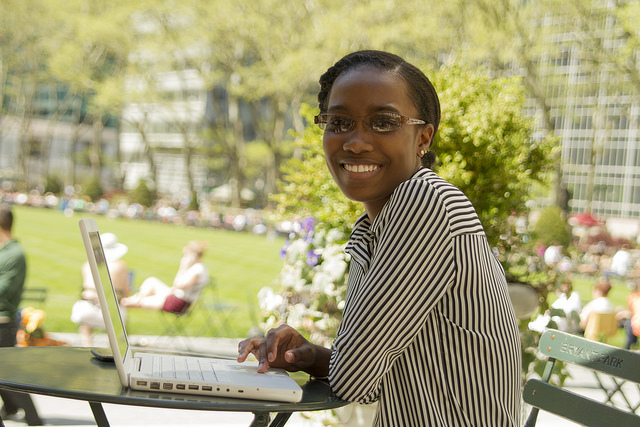 Since the courses are 100% online, the spaces that our course software creates become the classroom where we interact. If students cannot get to those spaces or do not fully understand how they work, they can fail the course. Given this potential, I make time for software instruction, no matter how packed the course is with subject area content and related work. Generally, I approach software instruction as needed to complete activities in the course. For instance, I talk about how to use banded rows to increase table readability as students work on an assignment that requires creating a table. The software instruction is directly tied to doing well on the activity, so students are motivated to learn the related technical skills. Look for patterns that suggest students need help. In both cases, I either provide a link to the documentation or provide a customized explanation with video or screenshots. These techniques work, but I’d like to do more. This term, I decided to focus on software instruction from the first day of classes. I gave students a curated list of links to the student guide to the software. Focusing on the commands and tools that I knew students needed for the course reduced the number of documentation links 90%, from 241 to 24 links. No longer do students have to search through pages and pages of information to find what they need—and I benefit from linking to the official documentations, which I don’t have to maintain. I asked students to read through the entire list. I don’t expect them to memorize the list or click on every link. I just want them to remember there was a resource that listed the main tools they need to use in the course. After skimming through the list, they chose at least one software task to learn more about. I asked students to read the details in the documentation and then try the tool. For extra points, students could post a reply describing what they found in their exploration. To my happy surprise, the activity yielded 75 replies. Students explored a variety of tools, focusing on whatever interested them. Repeatedly, students explained that they had found some capability in the software that they never knew existed. Will students remember everything they read? Undoubtedly not, but they do know where to find details on the key commands they need for the course. Since this was the first activity in the course, students and I can draw on it for the entire term. Overall, it seems like a successful strategy that I hope to continue using. How do you make time for software instruction in your courses? What resources do you share with students? Tell me about the strategies you use by leaving a comment below. I look forward to hearing from you. Photo Credit: _MG_3783 by VIA Agency on Flickr, used under a CC-BY 2.0 license. 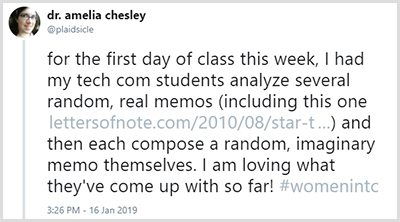 This week, I have a short post on a great resource (and one related class activity) that I found on Twitter as I was reading through messages with the #womeninTC hashtag. The TC stands for Technical Communication. The hashtag is a great source of ideas, articles, and support for those of us who teach technical writing. The activity sounded like fun, so I immediately clicked through to see the STAR TREK/Casting memo. Not only did I find an entertaining memo, but I was sucked into the website’s assortment of letters, memos, and other notes from the famous, the infamous, and the unknown. It is a rich collection of primary material that could be used in many classes, not just in technical writing. Is there a space program which we could win? As you wander through the site, I am sure you will find something entertaining. Let me know what you find, and share any ideas you have for using the site. Just leave me a comment below.